Matthew Price, a Monroe high school student, noticed that the elementary buses were being followed by the Monroe police. They were telling the kids to get off quickly and into their homes and have doors locked. See Voice Discussion: Police tailing school buses? 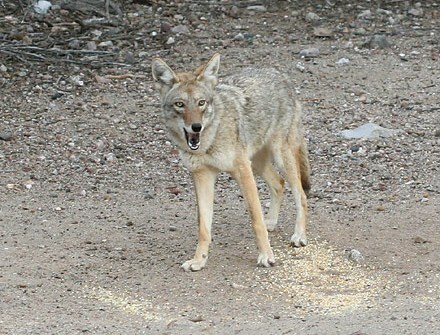 It turns out that the police were following the school busses because Monroe has coyotes! Monroe Voice poster Phil, last name not given said, "Coyotes also like feral cats. My neighbor feeds them everyday and they will not go away." Ellie, also a Voice Poster said, "I've seen them, especially in the morning. I see them streak across 63 from the large field (near Rt 4)to the neighborhood across the road. They're skinny little things and they're quick; graceful."